Edge devices, IP cameras and AI Box, observe worker’s skeleton and pose in a factory and check through captured time series data by unsupervised machine learning. They detect unusual objects in the same way. 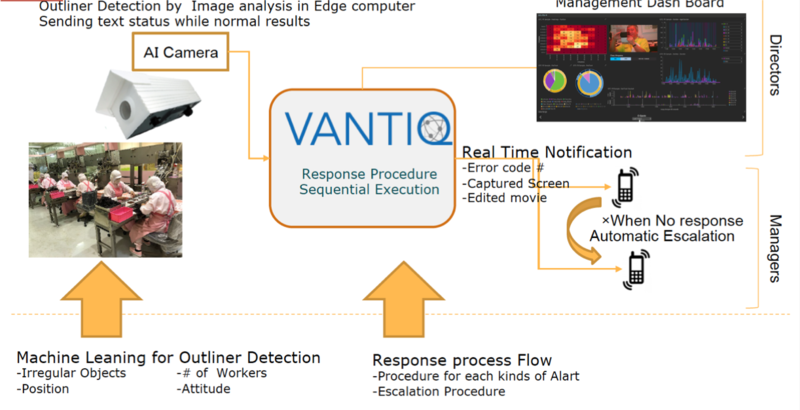 Once status is judged abnormal, data is sent to VANTIQ and alert a supervisor to the situation. Gathering worker’s skeleton and pose data through edge devices, IP cameras and AI Box (Jetson TX2). Detecting abnormal status and unusual objects through unsupervised machine learning. Enabling check records of anomaly detection on a dashboard. OpenPose, which works on edge devices, as IP cameras and AI Box set up near production lines, detect worker’s skeleton and pose in a factory. Through skeleton data OpenPose captures, TensorFlow judges if a pose is normal or abnormal at the primary level. 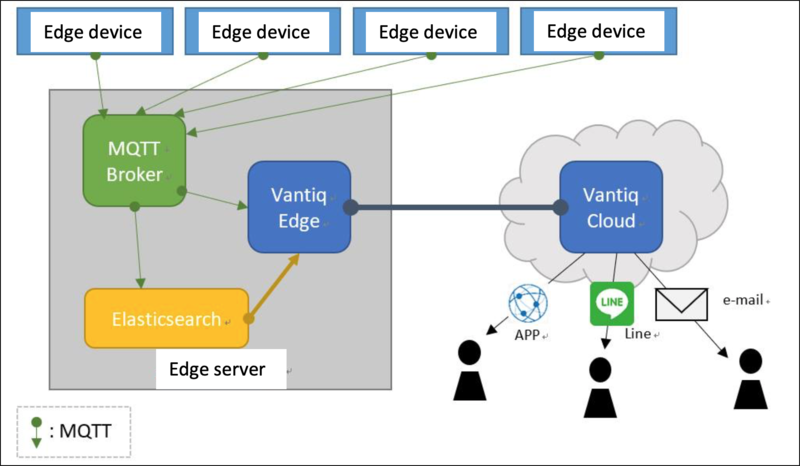 Data captured by edge devices is sent to MQTT broker in an edge server, then MQTT data is registered in Elasticsearch. Unusual skeleton data detected through unsupervised machine learning is sent to VANTIQ, using Webhook. All of datum gathered to VANTIQ Edge is checked again if it’s normal or not. Datum are recorded along with captured images in VANTIQ Cloud and used for anomaly detection’s administration and notification. A dashboard is provided as well, on which recorded datum can be seen. Unusual situation in a factory, in case a worker collapses, can be detected immediately through a worker’s skeleton and pose detection. Contamination or failure can be detected soon through checking worker’s unusual behaviors.